Catholic schools in the Diocese of Broken Bay exist to educate and form children in Catholic discipleship by offering them experiences of following Jesus as members of a Catholic community. Our role as a Catholic Parish School is to support parents in nurturing each child’s faith and moral development. 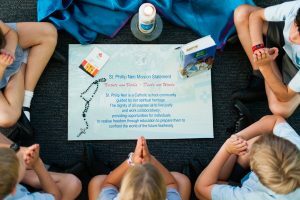 We use the Religious Education Curriculum K-12 that has been developed by the Broken Bay Catholic Schools Office in consultation with Bishop David Walker. With careful reflection and guidance the children are led to new insights about their faith. We celebrate our faith together through prayer, liturgy and the sacraments. Special days and events are celebrated through Masses, Paraliturgies and assemblies.